★★★★☆ One hilarious unexpected complication after another. 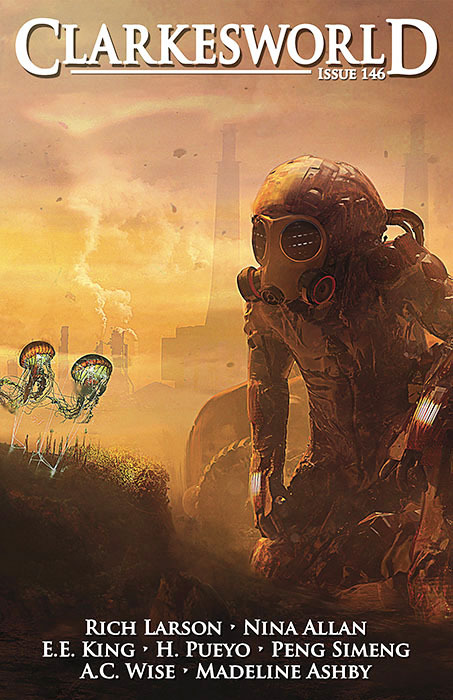 "Octo-Heist in Progress," by Rich Larson [bio] (edited by Neil Clarke), appeared in Clarkesworld issue 146, published on November 1, 2018. Pro: The biggest attraction of this story is the tangled plot. Etta’s explanation of how she got into this mess is complicated enough, but the way it works out is hilarious. Yeah, when something attacks your dog (sort of a dog) in your house, you almost never suspect an octopus. Pico is, hands down, the most endearing character in the story, and we’re happy to see him get his freedom at the end. We’re also happy to see him reward Etta’s kindness. Etta herself is a piece of work. The mature thing to have done would have been to just swallow her pride, go back to the house, apologize, and meekly ask for the shoes back. (But then there would be no story.) Running all over Hell’s half-acre to avoid embarrassment is a quintessentially adolescent thing to do, and it’s gratifying at the end that she decides to tell her sister the whole story after all. Maybe she did grow up a bit. Con: The octopus is way too intelligent to believe. In fact, I think he’s the smartest character in the whole story! But for him to reward Etta by dragging out the shoes, he had to have understood what she wanted, and that’s a bit much.